Important: Discounts cannot be set from the main Products page. They must be applied within a Presentation in Tile View. Editing a Product's starting price will change it everywhere. Open a Presentation and make sure you are viewing your products in Tile View. Click a product's price to bring up a popup and type in the new discounted price. 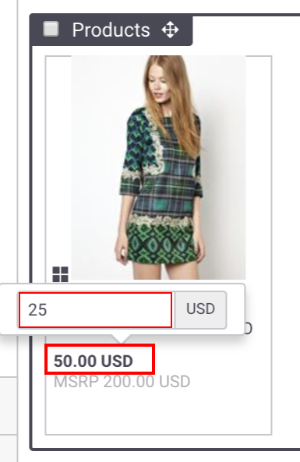 In this example you would click on "50.00 USD". Click away from the pop up or hit Enter to close the box. Then click the Save button to save the changes to your Presentation. 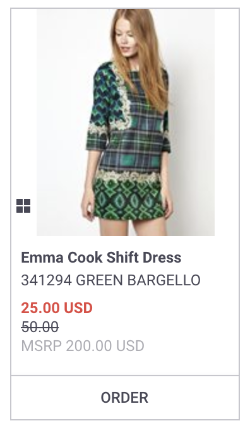 This is how a discounted price will look to your buyer - with the discounted price in red and a slash through the original price. See the article "Apply a Discount to a Section"